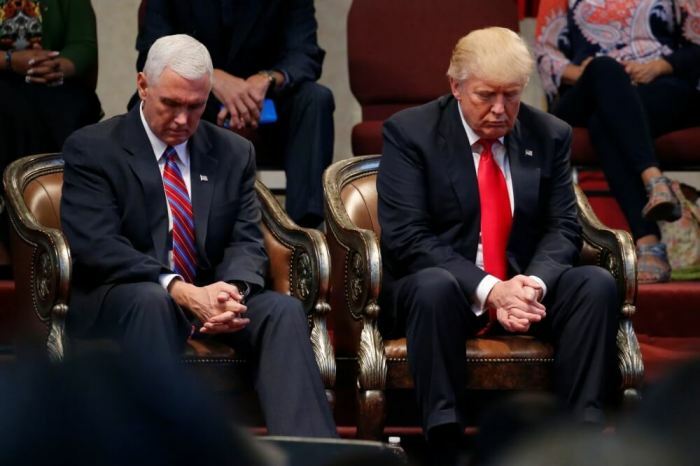 Key officials of the Trump administration have embarked on an undertaking to bring God into governance as they gather each week to hold prayer sessions and study the Bible in an effort to "grow themselves spiritually." Nine Cabinet officials led by Vice President Mike Pence, who is well known for his Christian worldview, are sponsoring the hour-long session, which takes place weekly in Washington, CBN News reported. Faithwire identified the eight other top Cabinet officials as CIA Director Mike Pompeo, Environmental Protection Agency (EPA) Administrator Scott Pruitt, Education Secretary Betsy DeVos, Housing and Urban Development Secretary Dr. Ben Carson, Agriculture Secretary Sonny Purdue, EPA head Rick Perry, Secretary of Health and Human Services Secretary Tom Price, and Attorney General Jeff Sessions. The weekly prayer session is led by the founder of Capitol Ministries, Ralph Drollinger, who reportedly planned the initiative during the early days of the Trump administration. Capitol Ministries also holds weekly Bible studies in the House and Senate. It has also started Bible studies in a number of state capitols and is currently working on expanding into international capitols, according to CBN News. Drollinger said he thought of arranging the prayer session and Bible study because he believes it's essential for top government leaders to have God's guidance as they fulfil their duties to the nation. "In terms of a country's health and direction, when its leaders are seeking God, the nation is in a position to be blessed by God in ways that are 'far more abundantly beyond all that we ask or think,'" he said. Leaders of the Bible study have made it known that President Donald Trump is always welcome to join them. Questions have been raised on whether Trump is truly a devout Christian. In an op-ed piece for The Christian Post last week, Dimas Salaberrios, a pastor of Infinity Bible Church in New York City, noted that prominent faith leader James Dobson called the president "a baby Christian" while some pastors have agreed that Trump is a young Christian. Salaberrios also took note of the criticisms raised against the president for his threats to separate families through immigration, speaking disrespectfully about women in his past, and the insensitive gaffes he made during the campaign trail. However, the pastor was impressed with Trump's stance on Syria when the president defended the orphans and widows of the civil war. "Even at the expense of upsetting some hard right liners, he defended the defenseless and that was a righteous act," Salaberrios said. It sent a message that America does care for "the least of these." The pastor believes that Trump could be a "young believer, working out his faith, on the biggest platform in the world as President of the United States of America."